During the meeting, the officials discussed transatlantic co-operation, the protection of citizens’ interests in case of Brexit, the stance on the multi-annual EU budget, the development of Rail Baltica, relations with Russia, as well as other issues of concern for the population of the Baltic States. “We have many things to do together to raise the standard of living of our people and balance the development of capital cities and regions. Our meeting demonstrates that the unity of our countries is alive and strong, and it has never been better," stressed K. Kariņš. 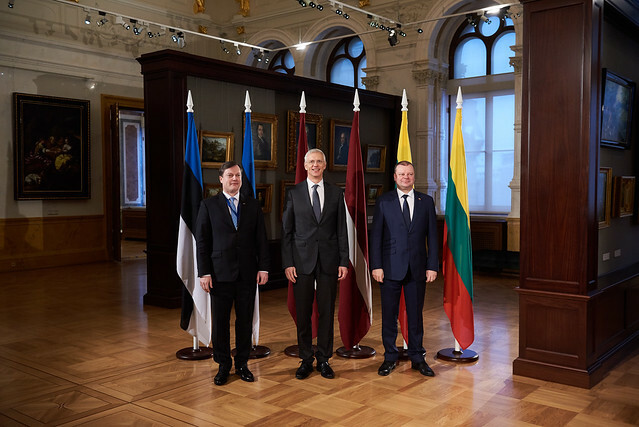 A bilateral meeting between Prime Minister of Latvia Krišjānis Kariņš and Prime Minister of Lithuania Saulius Skvernelis was held within the framework of the Baltic Council of Ministers. The Heads of Government addressed the questions of interest to both countries - the EU, infrastructure and security related issues, which will be on the political agenda in the coming months. During the meeting, K. Kariņš made a proposal to organize a joint sitting of the governments of Latvia and Lithuania in Rīga. The meeting of the Baltic Council of Ministers was held in Rīga today. This year Latvia holds the Presidency of the Council. The meeting was attended by Prime Minister of Lithuania Saulius Skvernelis, while Estonia was represented by the Ambassador of Estonia to Latvia Arti Hilpus. The Estonian Prime Minister Jüri Ratas was unable to arrive in Rīga due to adverse weather conditions. The Baltic Council of Ministers is an institution of intergovernmental co-operation between Latvia, Lithuania and Estonia, and this year marks its 25th anniversary.